This is unabashedly personal, so read if you want to know about ME. I knew I hadn’t posted anything on here in a while, so I looked back to see how long it had been. Maybe that wasn’t such a good idea. Four months is quite a moratorium. I did complete Picture Book Idea Month, and I even got a few workable ideas from that. And I’m working on a couple. National Novel Writing Month saw a good first week, so I got a good start on one of my middle grade ideas – a hybrid of two ideas I had worked on before. Nothing is ever wasted. After that, came holidays, a personal writing retreat, a new critique group, the opening of registration for our regional SCBWI next month, and a trip to New York for the SCBWI conference there. Whew! Two different manuscripts found their way to the writers roundtable in NY. I got a lot of great feedback on both, so, naturally, I have even more work to do than before. Many words of wisdom flew around during the main conference. Queries should remain relevant to the work you’re trying to sell. Diversity is good, but not just for the sake of diversity. Common denominators for good middle grade writing include: know your market, know your reader, use an authentic voice, be original, write about things that matter, characters should stand out, include surprises, and leave the reader with something of substance. Endings are also important. Next, I’m planning to participate in the great Reading for Research Month challenge conducted by colleague Carrie Charley Brown, which involves a lot of note taking and trips to the library for picture books. Yes, I AM a glutton for punishment. Oh, and the last book I finished was NOT a children’s book. 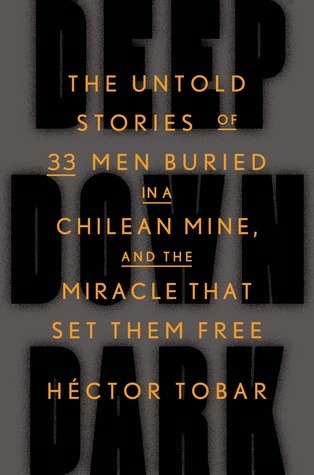 For a book club, my husband and I read Deep, Down, Dark: The Untold Stories of 33 Men Buried in a Chilean Mine and the Miracle That Set Them Free by Hectór Tobar. It’s a very engaging account of the mine disaster from 2010. All the men survived. I remember being gripped daily by the news stories for the two months they were buried. The author did a great job of putting a face on the men, their families, and the rescue team. Highly recommended. On to the next project. Good Stories – They’re Everywhere!